Looking to keep up to date on the latest food safety practices and help strengthen your Growing Forward 2 application? OSCIA is once again offering food safety webinars covering 6 different topics, taken from the comfort of your home or business - all you need is an Internet and phone connection. The workshops are open to all farmers, but have a primary focus on the horticulture industry. 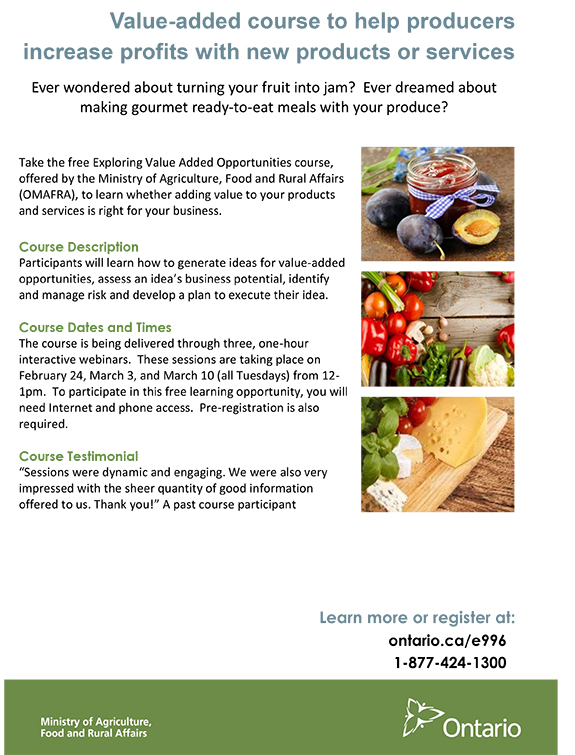 Contact foodsafety@ontariosoilcrop.org for details. This session focuses on the significant role cleaning and sanitizing play in producing safe food on-farm. This session focuses on the impact pests, building maintenance and visitors can have on the safety of the food you produce and identifies ways to implement good agricultural practices to reduce these risks. This session focuses on using soil amendments such as manure, compost or compost teas for soil fertility and on the food safety risk if not used properly. Good agricultural practices, and the role they play in reducing the risk when using soil amendments, are highlighted. Water used prior to harvest and post harvest plays a significant role on the safety of the food you produce. This workshop explains the role of good agricultural practices in reducing the food safety risks associated with using contaminated pre and post-harvest water. An effective recall program is critical to the success of your business. This session will discuss the importance of developing and implementing a recall program; equipping participants with the knowledge and tools to implement a facility-level traceability system and perform a mock recall. The Kawartha Farm Stewardship Collaborative (KFSC) invites farmers and rural landowners to attend the 3rd Annual Kawartha Farm Stewardship Workshop on Saturday February 7, 2015 at Rolling Hills Public School in Bethany (20 minutes west of Peterborough). The event is designed to celebrate the stewardship achievements of the past year, and to inform the farming public about the resources available to support on-farm stewardship. This full-day workshop will feature presentations by farmers and industry professionals on topics such as: practical strategies for reducing neonicotinoid use (Greg Stewart, OMAFRA); creative options and solutions for livestock watering; the benefits of wetlands and biofilters in farm drainage; the 4R’s of nutrient stewardship; as well as the various sources of funding and technical support available to farmers across the region from KFSC partners. Tickets to the event, which include a hot lunch, are $25/person. Pre-registration is required, and those who sign up before January 19 will receive a complementary satellite map of their farm property. Door prizes will include 10 chances to win $100 towards on-farm soil testing. 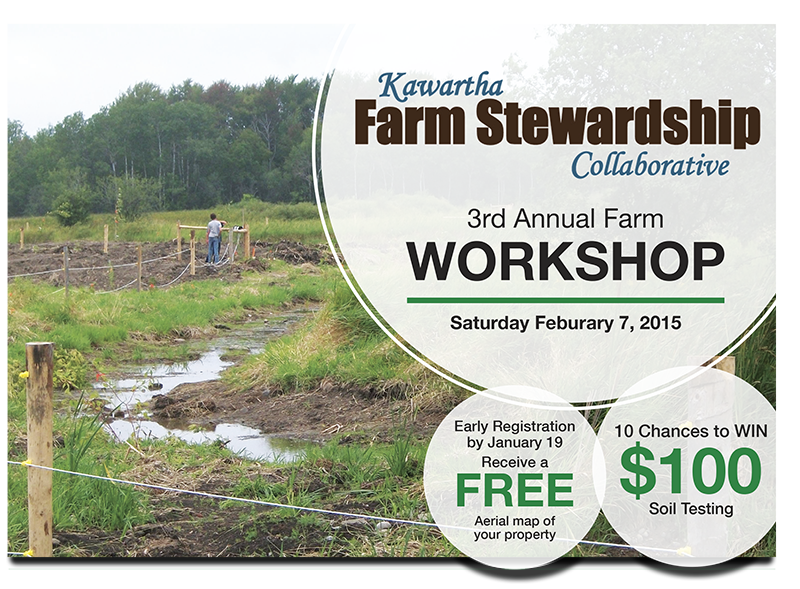 For full registration details, visit www.kawarthafarmstewardship.org. For more information, please contact Holly Shipclark: (705) 328-2271 x 240 | hshipclark@kawarthaconservation.com. Are You Plugged In To Your Local Commodity Organization? Winter is the time for farmer meetings, and many interesting events and annual meetings will be happening across east central Ontario this season. Local commodity groups are a great source of information and a fantastic way to meet fellow farmers. Check out our list of regional commodity organizations to search out and find the groups you may want to connect with. And consider signing up for the Ontario Soil ad Crop Improvement Association's News and Views to keep up-to-date on events and happenings in our region and across the province.